Help prevent frostbite this winter by keeping your hands nice and toasty by making two hand warmers that will help keep you warm while you are outdoors. Not only is it easy to make, but this simple DIY also makes an inexpensive gift idea that can be made for less than $1.00. To begin, take a small piece of paper that is approximately 3.5" to 4" wide and fold it in half. On the folded piece of paper draw the outline of half a heart with a pencil. Cut out the heart shape with scissors. Place the paper heart onto a piece of felt and trace the heart shape twice using a pencil. Using scissors cut out both traced hearts. Place the two cut hearts directly over top of each other. Using thread that matches the color of felt, thread a needle with some thread. Sew together the two hearts along the edges, but leave a small section about 1 inch wide open so you can fill in the rice. Place a funnel in the open section of the heart and fill the felt heart with rice by pouring the rice down the funnel. Continue adding rice until the heart is completely filled with rice. Once the heart is filled with rice sew together the rest of the felt heart. Next to hide the thread stitches along the edge of the heart lightly run the needle back and forth over the exterior edges. This will cause the felt fibers to move slightly and hide the stitches. Repeat the last four steps so that you end up with two hand warmers, one for both hands. To use the hand warmers microwave them for 20 to 40 seconds until they are warm and place them inside your coat pockets or your gloves to keep your hands nice and toasty while you are outdoors. Make sure to use caution grabbing the hand warmers out of the microwave as they can get very hot after being microwaved. 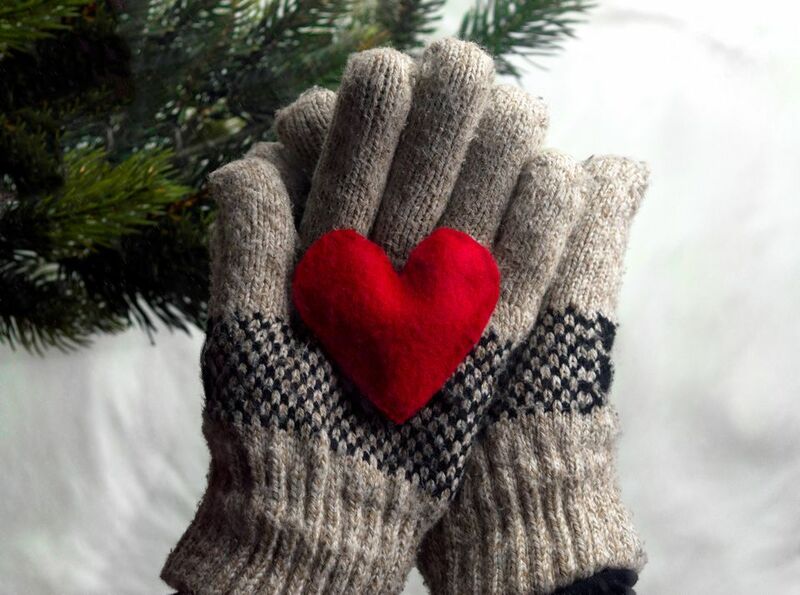 The hand warmers can be reused, so make sure to always microwave them before heading out in the cold. For a quick gift idea wrap together two of the DIY hand warmers together with some twine and write the microwave instructions on a small sheet of paper.